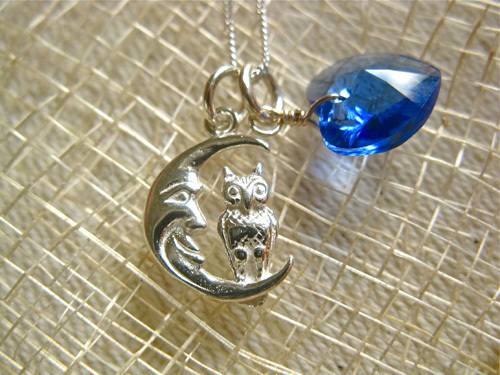 This sweet little owl-in-the-moon necklace with a birthstone crystal heart, makes a unique gift. The owl is a symbol of wisdom, truth, patience, foresight and knowledge, and a protector against harm. The moon is a symbol of eternity and immortality, a feminine symbol representing the soul within the rhythm of time. The sterling silver owl-in-the-moon charm is 18mm in length including the hanging ring, and sits with a heart made of birthstone crystal and sterling silver. Please choose birthstone colour in options box when ordering. If you want the crystal heart for a birthstone, choose GARNET for January; AMETHYST for February; AQUAMARINE for March; CLEAR (crystal) for April; EMERALD for May; ALEXANDRITE for June; SIAM (ruby) for July; PERIDOT for August; SAPPHIRE for September; ROSE (tourmaline) for October; TOPAZ (citrine) for November and ZIRCON for December. The 2-part necklace hangs on an 18" sterling silver fine curb chain. Traditionally, the owl is a symbol of wisdom, truth, patience, foresight and knowledge. But historically, the owl is also seen to be a protector - against harm, and ill-fortune . . especially when coupled with the feminine caring of the moon in this charm necklace. So this piece of owl/moon jewellery can be gifted to a friend or loved-one to wish them patience and insight as well as knowledge and foresight (which can be useful, for example for exam success) along with an element of feminine caring and protection as they travel through life. Help instill patience, wisdom and protection with this enchanting little owl and gemstone necklace. Ideal to promote wisdom and protection for challenges such as a competition, exam or new job, or when travelling. Comes gift-wrapped (with an information card if you want) like all our presents - and we can print a personal message on your behalf.